Metro issued a long news release this afternoon explaining the process in which the Mulholland Bridge will be partially demolished this weekend when the 405 is shut down over the Sepulveda Pass. •This is not an “implosion” type demolition. Half the bridge will be taken down by machines — giant jack hammers — nibbling away at the structure. •About 4,000 tons of concrete are expected to be removed from the southern half of the bridge. While the southern half is rebuilt, the northern half of the current bridge will remain open to traffic. The northern half will be demolished in a similar exercise next year. •The release says this is the first time in half a century that the 405 in this corridor will be completely shut down. •The current Mulholland bridge is currently 72 feet wide, 579 feet long and 80 feet high (60 feet from the bottom of the bridge to the 405 roadbed). The new bridge will be widened by 82 feet wide and 608 feet long. The placement of the new columns will allow the new freeway lane — a carpool lane — to be built on the northbound side of the 405. Contractors for the I-405 Sepulveda Pass Improvements Project are planning a precise, carefully orchestrated ballet of workers and machinery to demolish half of the Mulholland Bridge the weekend of July 16-17, not a Vegas-style demolition. The iconic three-span box girder bridge, standing tall between the canyon vistas connecting San Fernando Valley suburbs with urban Los Angeles’ Westside for more than 50 years will see its southern side steadily chipped away over 53 hours, not 53 seconds. The demolition will be accomplished utilizing the relentless “tat-tat-tat” of jack hammers mounted on heavy equipment, not dynamite. Besides the sound of demolition in the immediate area, the I-405 in this corridor will be silent for the first time in 50 years. Kiewit Infrastructure West, the project’s contractor, has been working on aspects of the demolition plan for over a year, and has developed a timeline for the 53-hour demolition which breaks work activity into precise, 15-minute increments. 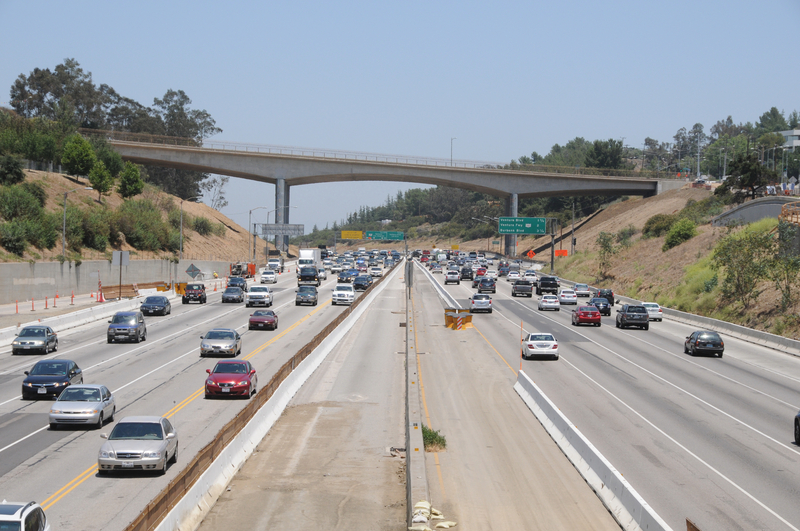 The contractor will know exactly where it must be in the work schedule in order to safely reopen the freeway for early morning rush hour traffic Monday, July 18. The demolition plan has been meticulously reviewed and approved by project partners Caltrans and Los Angeles County Metropolitan Transportation Authority (Metro), and is considered the best demolition method available. Throughout the weekend, the contractor will look for opportunities to expedite the schedule. The demolition timeline will begin Friday evening, July 15 when work crews begin closing freeway on- and off-ramps between the I-10 and U.S. 101 as early as 7 p.m. to prevent additional vehicles from entering into the closure area. Crews will then begin closing freeway lanes one by one on both sides of the freeway at 10 p.m. in order to achieve a full freeway closure by midnight. The Mulholland Bridge also will be closed. The area surrounding the Mulholland Bridge will be lit up like the Astrodome utilizing two very large light plants and about 12 regular light plants. Staged in nearby project construction yards and other areas, 15 pieces of heavy construction equipment (with another five on standby) and an army of 100 demolition workers and support staff will be poised to begin their precision operation. Starting at 12 midnight, trucks will begin to haul dirt onto the 405 freeway underneath the Mulholland Bridge to form a cushion four feet high on the freeway roadbed. The dirt will catch falling debris and prevent concrete pieces from damaging the freeway lanes. At approximately 2 a.m. Saturday morning, workers will use a large diamond-bladed saw to cut the bridge top deck and soffit to safely demolish the southern half while keeping the northern half structurally sound. Workers also will cut slots in the southern side of the bridge to quicken the demolition process. During demolition work, workers will perform vibration monitoring and other tests to ensure the structural integrity of the northern side of the bridge is retained at all times. At approximately 5 a.m. Saturday morning, as many as four “hoe rams,” or rolling jack hammers of various sizes will begin to chip away at the south side of the bridge. Approximately 4,000 tons of concrete will be removed in the first phase of demolition work. Two Hoe rams will be stationed on the bridge deck starting in the center working toward each end. Once they have reached the ends of the bridge, two hoe rams will begin to work on the ground also starting in the center and working toward both ends. These giant and powerful demolition machines will deliver between 1,200 and 7,500 foot-pounds of power to break away concrete from the bridge. This compares to 90 foot-pounds delivered by a common hand-held jack hammer. Operators in these machines will be able to deliver between 300 and 600 blows per minute on the concrete decking to break pieces into sizes no bigger than a basketball or microwave oven which can then be easily hauled away from the demolition site. Later, the concrete will be pulverized and recycled. The bridge’s railing will also be taken down by hoe-ram. Front-end loaders will also be used during the demolition to load demolition debris into trucks. While the hoe rams steadily chip away at the concrete, other workers using long-handled oxygen/acetylene torches will cut the steel rebar from the bridge deck amid a crackle of sparks. Workers will be tied to a secure anchor and will be wearing fall protection equipment as they work. Workers will continue to cut the rebar into smaller pieces on the ground so that it can also be recycled. This demolition work is expected to last throughout Sunday, July 17 as crews also demolish the bride’s south columns, leaving the other two columns in-tact to support the north side of the bridge. Once the demolition operation is complete, an army of laborers will thoroughly clean the edge of the bridge to assure that no particles are left to fall on the traffic below. Finally, the remaining portion of the bridge will be inspected by structural engineers from Kiewit and Caltrans. This demo work is expected to last until 2 a.m. Monday morning, July 18, when crews will wrap up demolition and begin their final cleanup to prepare the freeway for reopening by 5 a.m. Between 10 and 20 large trucks and several front end loaders will be used for the cleanup. The freeway surface under the bridge will be cleaned by a parade of street sweepers, inspected, and finally restriped with fresh paint. Ramps and freeway connectors will reopen by 6 a.m.
Construction crews will work to rebuild the southern half of the bridge over the following 11 months. Once the southern half of the bridge is rebuilt, traffic will be moved from the northern side to the new southern side, and crews will be ready to demolish the northern side next. A similar, 53-hour closure of the I-405 also will be required to protect public safety during the demolition process. One-half of the bridge must remain open during both bridge phases to ensure residents and emergency responders can access canyon community areas. The Mulholland Bridge was built in 1959 by the same contractor that will be replacing it more than 50 years later: Kiewit. The bridge is currently 72 feet wide, 579 feet long and 80 feet high (60 feet from the bottom of the bridge to the 405 roadbed). The new bridge will be widened by 10 feet to 82 feet, and lengthened by 29 feet to 608 feet. Importantly, the location of the new columns will allow for the contractor to build the additional freeway lane underneath the bridge on the northbound I-405. The bridge’s columns were earthquake-retrofitted in 1996. The new lengthened and widened bridge will be designed to the latest seismic standards. The tallest, most iconic of the three overcrossing bridges to be demolished and rebuilt as part of the project (Skirball and Sunset bridges are the other two), the Mulholland Bridge is considered an exceptional representative of mid-20th century California bridge construction due to its graceful lines and slim profile. Its 235-foot central span was the longest in the Western United States of this bridge type when it was constructed. The new longer and wider bridge will look similar to the existing bridge by design to preserve the bridge’s aesthetic, architectural appeal for future generations. Information online: Go to the I-405 Closure Media Kit at metro.net in the “News and Media Now” tab for media kit materials and to download a side and aerial rendering of the completed Mulholland Bridge, hi-res photos and b-roll of the demolition of the Sunset Bridge in July 2010, which demonstrates the construction activity planned for the demolition of the Mulholland Bridge. Visit the project web site at www.metro.net/I-405. Follow us at twitter.com/I_405 and facebook.com/405project. AGREE with @Robert. Please show a webcast! We might have Social Security taken away but we have money to spend on unnecessary projects like THIS??????? @ Jane Unnecessary? I take it you’ve never driven in that area before of you would understand why this is pefectly necessary. I drive this freeway all the time and I agree with Patrick, Jane, and David. Agree – waste of money – put a subway tunnel from the valley to westwood and on to LAX and then you have options and probably better morning commutes (oh and I am a 405 driver – wishing i could be a train commuter from westside to the valley. This lane will be full a year after completion. 1) prepare the space below the bridge necessary to widen the freeway along with the new lane. 5) open the new lane to the existing freeway.